Los Angeles is a definite car society. The layout of the city makes the life impossible without a car. It’s often questionable if LA is a “city” in the first place. For instance, stores doesn’t spread in a walking distance. It’s rear that you can get a neighborhood feeling living here. Maybe the geological fact “ocean on the west, desert on the east” has got something to do with this. It’s just very open, spread out space. In order to have a social life in LA, having a car is a must unless you have endless links of friends, who are willing to spare extra drive for you all the time. You cannot possibly count on bus after 9pm. Don’t expect the taxi to come find you on the street either. “I’m just gonna run to the store,”, well yes, with a car. Somehow LA succeeds to be an isolating city despite of its function and population size. I always missed the intimacy and chaos of the “city” while residing here. However, lately I came to realize this spacious landscape has been contributing to the street art. 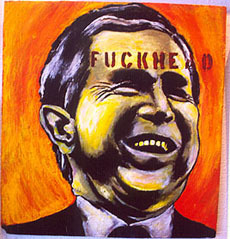 Not that it’s new, but art on the street has definitely been causing more awareness and impact on public these days. How you pull out a cynicism by placing your piece of statement in the cityscape, is the attitude amongst many street artist, not only limited to city of LA. Even all time legal contributor advertising industry, has been buying the impact of these raw methods and joining the party. Probably there’s no need to mention the king of postering Shepard Fairey (BLK/MRKT, “OBEY-GIANT”), this has become an indeed popular method for many artists and followers. Since the art itself has been made in the print shop already, you get to play with the size, placement, and quantity. One gloomy day, I was lucky enough to come across Dave Kinsey’s (also BLK/MRKT) man figure and arkitip spaceman (by Scott Snyder) at the corner of the building, which you’ll see as one of the opening photos. 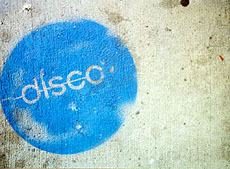 It’s always fresh to see them placed on the building wall especially if you are familiarized with their work in print. 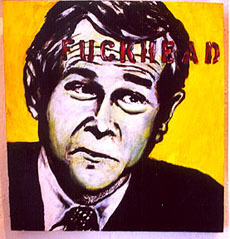 Posters, usually quite large in size, succeeds to suggests the physical existence of the artists there after. 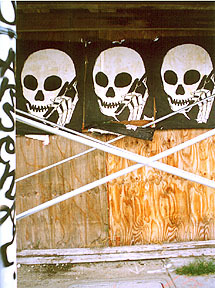 Recently, these “skull w/ cell phone” posters have been so provokingly meaningful, maybe due to Nikki Taylor’s unfortunate cell phone related car accident, or for the brain tumor theory? 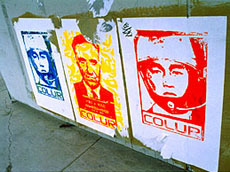 Speaking of theory, COLUR THEORY, has creeped me out since one of the political figure they used is a wanted montage photo (has been known for its replacement of the face part, since no one actually witnessed him) from Japan. In 1968, this suspect managed to rob $3,000,000, by wearing sheriff uniform on a motorbike. Many other new artists have been winning recognition by getting it seen in various locations, making the public wonder who they are. This has been annoying many show window owners in the city. The new method yet spreading out fast, is more pain than spray paint. Originally retailed for glass-etching purposes, the makers of this chemical have been getting dozens of complaints. Seems like some smart kid who realized in art class that it can be applied to the street went out to prove it. Didn’t take long from there for the word to be spread. 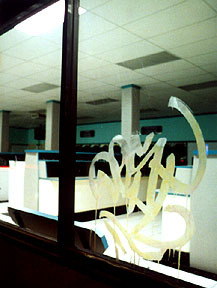 Some store windows with serious damage are forced to replace them with painful costs that could easily effect the business financially. Imagine a decorated glass. Would that beautiful design fade as you wash them? The answer is, “never”. Advertising industry could not possibly remain blind while these happenings of street interaction. The impact and strength of the message have convinced them way far. For example, despite the failure before its appearance in LA (although the launching party took place anyways one night hosted by FLAUNT magazine just for the reason that the word was out and the money was already spent. It was a silly night, typical Hollywood party but completely lost in the purpose part. ), MODO.NET has called in quite a bit of attention. 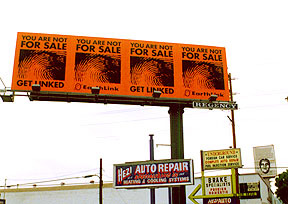 Huge billboards that were thoughts provocative, reflecting stickers, and stenciling with pastel colored spray paint on the sidewalk. At least they got people talking about them. Many record labels are too hitting the street upon their artists’ album release. 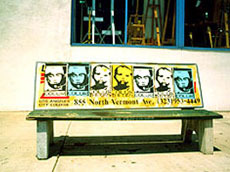 For example when Radiohead came out with KID A, the street campaign added to the hype. 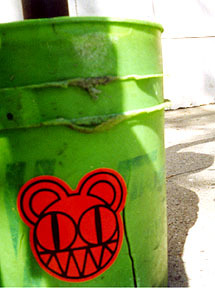 Stickers and stencils of that twisted teddy-cat character, was not information friendly at all for those who didn’t know. While advertising is meant to inform people, KID A campaign was all about the code and were only addressed to the ones who can decode them. Radiohead’s new album AMNESIAC, which came out just couple days ago, is contributing to the cityscapes once again. Street is an infinity space of unconsciousness, yet big part of people’s daily life. Just think of leaving your home to work. You just take the same route to get to the destination, which you discover is the fastest after several trials, nothing ever new to bother noticing. Or is there? For some people street is where things are constantly updated and provides the slight difference everyday. Nothing lasts forever on the street. It’s the closest from your reality space that you will end up linking with almost all the time. No intentions are required here while going to museums and galleries do. LA in a way allows the streets to expand under its arms just really far. The presentation doesn’t have the kitsch-ness or chaotic charm that NY or SF might have yet the spaciousness automatically tasks the artists with sensibility and twist in placement of the art, which ends up in a big frame of the cityscape itself. Coming to realization that the everyday scene is full of meanings and codes, I barley can concentrate driving anymore. Last but not least. 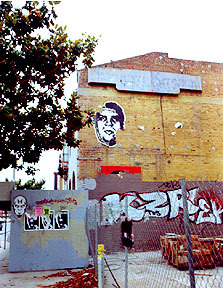 Here I’d like to present the ultimate aesthetics of Shepard Fairey’s postering – BLK/MRKT’s Earthlink billboard with Andre the Giant face postered in the background (can you see him?). Beautiful collaboration of the commercial work and the street art.